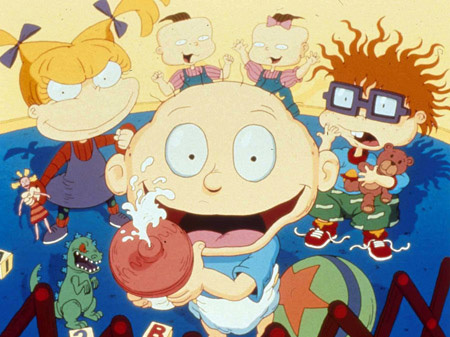 Rugrats was one of the original Nicktoons that aired way back on August 11,1991 sandwiched right in between Doug and The Ren & Stimpy Show. Nobody at that time could have predicted the massive success such a simple premise would have. It was essentially any other kids’ show about normal families. What made this show unique was the point of view. 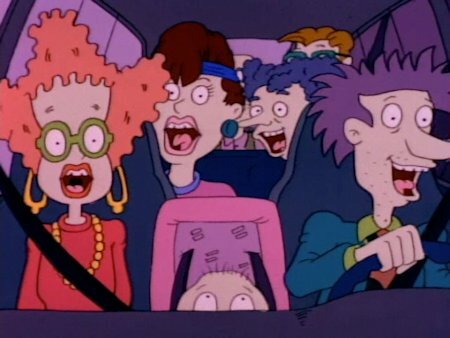 Though usually from the perspective of an older child, Rugrats showed the world through babies’ eyes. This let the show have a wide range of stories, because all of the adventures took place in their imaginations, showcasing all the ways their premature minds interpreted the world around them. 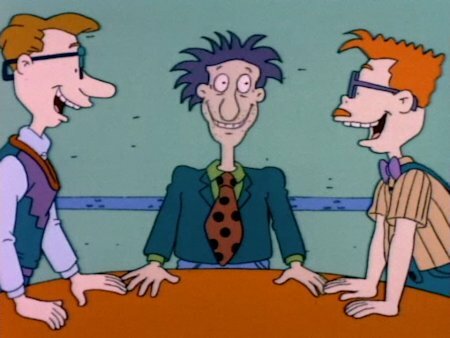 This rare point of view, combined with being one of the earlier cartoons to have hidden laughs for the adults that kids wouldn’t get ensured Rugrats would be loved for years to come. If we include the spin-off All Grown Up! 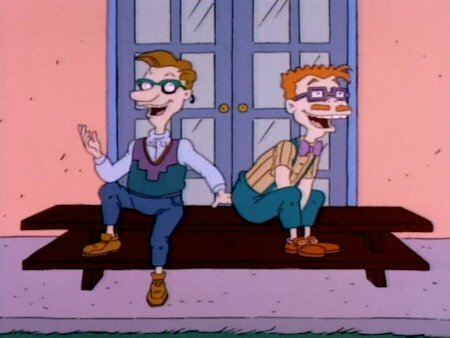 the characters of Rugrats were in new content all the way to 2008. This included three theatrical movies, five different holiday specials and nine video games. “The Santa Experience” is from season two of the nine season show. 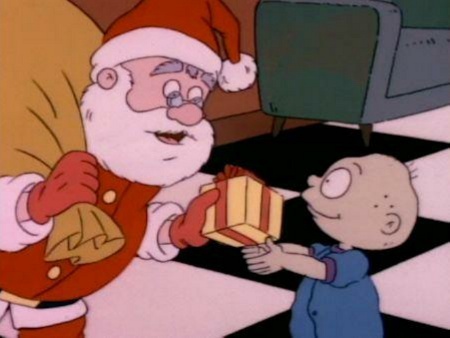 Rugrats was an interesting experiment when it came to holiday specials. 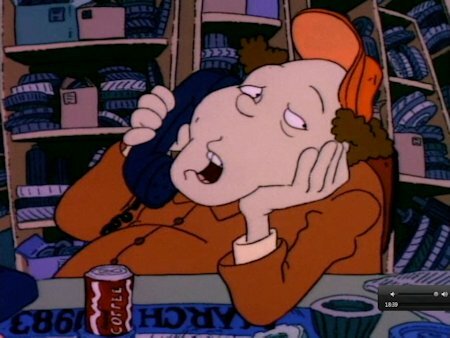 The Pickles family had a Jewish mother and a Catholic father. 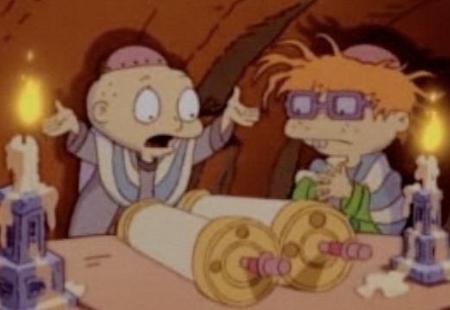 This allowed the creators to have the range to do not just two Christmas specials during the show’s run, but also a Chanukah special and a Passover special. There was even a Kwanzaa special because that was the holiday a neighbor celebrated. 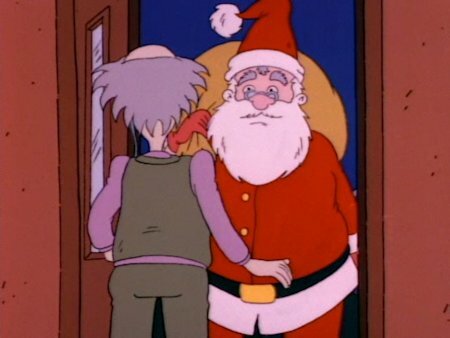 “The Santa Experience” was my favorite of all the Rugrats holiday specials. Admittedly, this was probably largely because that was the holiday I celebrated and the second Christmas special didn’t air until I was long done with the show. Even so, this special is great. This particular Christmas special starts out as many Christmas specials do, panning over a winter wonderland. As it continues to pan, a sad-looking employee is seen making artificial snow fall on a wintery set indoors. 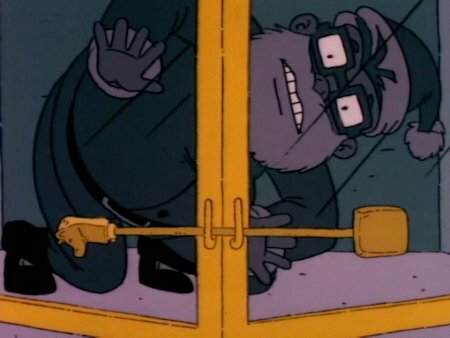 The Rugrats are waiting in line to see a department store Santa, a tradition loved by some and feared by others. It seems I can never walk by these things without witnessing a child wailing about sitting on a stranger’s lap. While waiting in line Chuckie is warning Tommy of all the horrors that come with the Christmas season. This includes the cold, the perpetually smiling adults and, of course, Santa breaking into your house! Tommy, being the brave one in the group, sees no harm in any of this and tries to convince Chuckie that Santa is good. Chuckie, however, just will not have it. When it is Angelica’s turn to see good ol’ Santa she aggressively charges his lap and proceeds to list off the seven different extravagant toys she wants. When Santa starts to say that it may be too many toys Angelica begins to wonder why he doesn’t already know what toys she wants. This quickly escalates to her pulling off his fake beard, revealing to the world (er, the whole mall world) the department store Santa is a fake! Back at the Pickles’ residence Angelica looks through her various new toys that she got for the Santa incident. This was something I found particularly interesting. 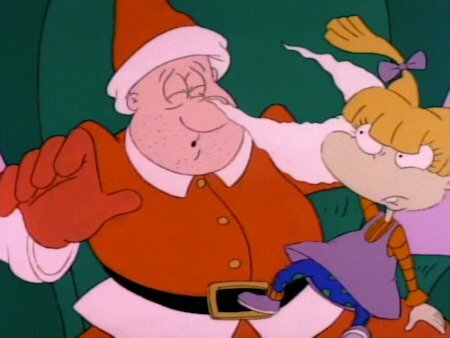 Shouldn’t Angelica be punished for misbehaving and pulling off Santa’s beard? Instead she was rewarded, most likely to prevent emotional trauma. 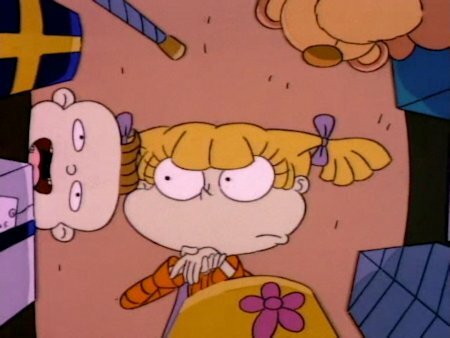 Meanwhile Drew is worried that Angelica will be scarred for life, and Chaz wants Chuckie to have a better Christmas then he ever did. This eventually leads to all the adults deciding they should rent a place up in the mountains and do Christmas right. Back in the living room Angelica sees an opportunity to play a cruel trick on Phil and Lil using her new box of toys. Phil doesn’t know what to get Lil for Christmas and Angelica convinces him some crayons for her favorite coloring book would be a great gift. But he can’t get them for free, so he trades away his favorite Reptar doll for the crayons. As if this dastardly deed wasn’t enough she then proceeds to make a similar deal with Lil. Lil trades her favorite coloring book to Angelica to get a Reptar space helmet to go with Phil’s Reptar doll. The poor twins have been played. Meanwhile a few other things are going on throughout the house. 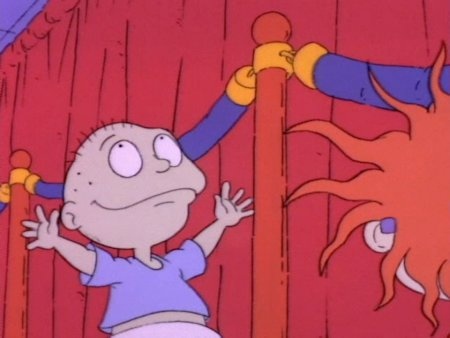 Tommy and Chuckie decide they will catch Santa and ask him if he is good or not. Foolproof plan… Drew and Chaz continue to think of more they can do to make Christmas special. At the exact same moment they have the same epiphany. Get a Santa for the babies to see on Christmas morning. The only difference being Chaz wants to play Santa himself, but Chad wants to hire a professional. Lastly Grandpa tells the story about how Santa will give kids coal. 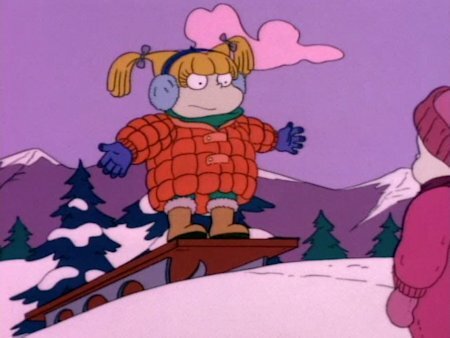 This leaves Angelica worried because of the trick she played on Phil and Lil. 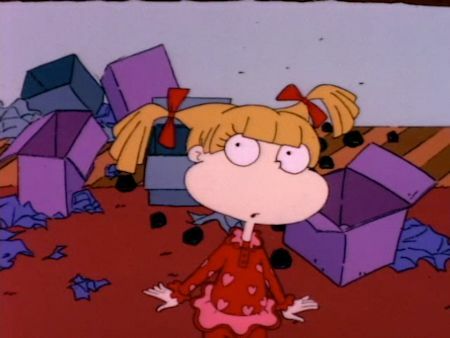 If anyone belongs on the Naughty List, it’s Angelica. That very night Angelica dreams it’s Christmas morning. She runs downstairs to see a huge pile of presents under the tree and they are all for her! But when she starts to open them she is shocked and horrified to see every present has nothing but coal in it. Santa even shows up to scold her for tricking the twins. She then wakes up screaming in her room. Her dad rushes in and she promptly asks him if it’s Christmas yet. When he says it isn’t she tells him she has to see Phil and Lil. After being told she will see them later that day when they go to the cabin she tells her doll that she has to give them their toys back before it’s too late. This is followed by the families driving to the cabin while singing Christmas carols. Upon reaching the cabin, everyone begins preparing for Christmas. This includes Tommy and Chuckie looking around the house for places to set Santa traps, like the doggy door and dining room windows. However, they dismissed the chimney as something that was too ridiculous for anyone to come through so it was left unattended. While this was going on the adults worked on supper and decorations. The only notable point of the decorating is that Didi at first brought an axe to chop down a tree and even picked out a tree, but at the last moment turned into an environmentalist and proclaimed the tree couldn’t be chopped down. All the while Angelica is trying to make things right with Phil and Lil. But adults keep taking the twins away for some reason or another so she doesn’t get anything done other than teaching them her understanding of the origin of presents. After the big turkey dinner the babies have to go to bed and this leaves Angelica hopeless. While in bed the babies futilely try to fight off sleep so they can be awake if they hear a Santa trap go off. They are soon fast asleep. The adults use their baby-less free time to sing more carols as Chaz sneaks away to change into his Santa costume and Drew phones “The Santa Experience” to confirm the professional Santa for later that night. All this leaves Angelica with nothing but time to wander the house, depressed that she will be getting coal instead of the toys she wants. This eventually leads her within earshot of a TV where she hears a commercial for what sounds like a counseling hotline and naturally assumes the number is Santa’s. She then tries to phone and gets Cogs Unlimited when she types in the wrong number. She demands to talk to Santa and doesn’t let the employee get a word in edgewise. Whether he is as sad as he looks about his life, or just annoyed with this child who is yelling at him the employee pretends he is Santa and tells Angelica she is on the dreaded Naughty List. This obviously ruins her. Quick cut to Chaz dressed as Santa climbing the house and stopping at the chimney. At the same time Stu walks through the front door and trips on one of the Santa traps the babies left. The noise awakes the babies who promptly run down stairs only to discover they didn’t catch Santa. The moment they calm down Chaz falls to the bottom of the chimney covered in soot. This scares the babies and Tommy quickly traps him in the chimney until Stu frees him. At this point all the babies ran and hid, until Chaz takes his beard and hat off to comfort them and reassure them it’s all okay. Nah, just leave him. He’ll be fine. Immediately after the babies all calm down the doorbell rings. It’s Santa! Or at least the babies think so. But we all know it’s really “The Santa Experience”. After saying there was a problem with the Chimney and that’s why he used the door Santa proceeds to give the kids their presents. While handing the presents out there were a few interesting moments. 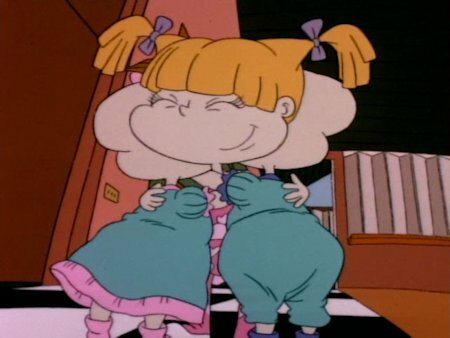 The first being Santa asking Chuckie “Still think I’m so scary?” The second occurring when Santa tells Angelica that “sometimes trying to be good is as important as being good in the first place” and giving her the Cynthia house she wanted. Both things the Santa experience actor shouldn’t have known to say. After Santa leaves everybody else opens the rest of their presents. This includes Phil and Lil opening their gifts and thanking each other for trading away their favorite toys. This is quickly followed by Angelica giving the twins their presents. Upon opening them they find out their presents were the toys they traded away. So it all came together perfectly in the end. The babies all got presents and are no longer scared of Santa, Phil and Lil got their toys back and everyone is feeling the Christmas special. As Chaz and Drew sit on the couch talking about how great the actor was the phone rings and Drew picks it up. It is Barney Stevenson of The Santa Experience. Apparently his car slid off the road and he won’t be able to make it, although us viewers could see he is in his messy apartment. Now the M. Night Shyamalan-esque twist has been revealed. 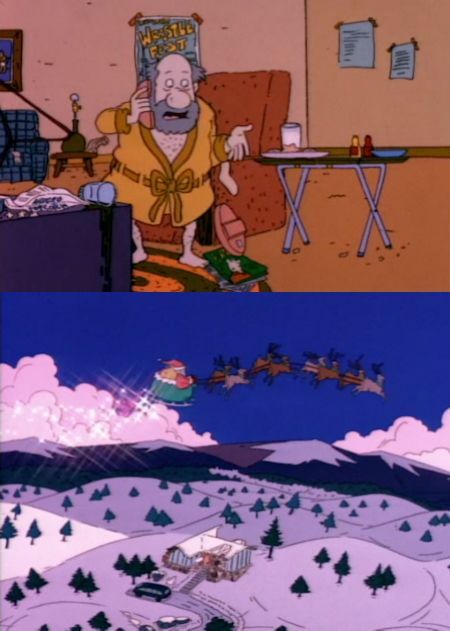 That was the real Santa after all! Not a single Jesus to be found. There were a few different fake Santas throughout the special that is worth some points for effort. More points need to be given for that reveal at the end. Plus, Santa’s visit was glorious. The adults were 100% into Christmas the whole time and the babies eventually came around after Santa’s visit. Even Angelica got into the spirit of giving instead of her usual cruel ways. “The Santa Experience” can be found in the Best of Season 2 3-disc box set or the Holiday Celebration collection. 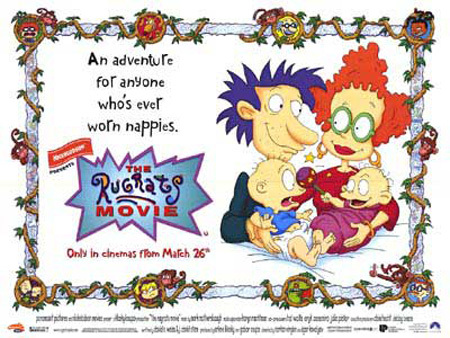 If you’re feeling nostalic (or want a gift that will hold up well enough for the next generation of youngsters) you can also grab the Rugrats Trilogy Movie Collection. Merry Christmas, from the WWE! Wonderful. God, Chad is rocking one ’90slicious sweater vest.